The graphic shows a pizza box with the url LittleFranksPizza.com. As you might have expected, Go Daddy is the registrant of that domain name, so it’s unclear whether Little Frank’s Pizza is actually a customer or used to be illustrative of what customers can do with the Website Builder product. There is one major problem though. 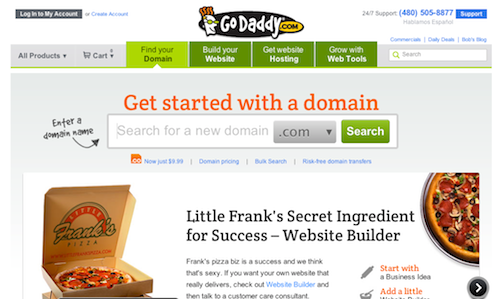 When you visit LittleFranksPizza.com, which some people might do to see what a Website Builder website looks like, there is a standard Go Daddy landing page. People unfamiliar with these landers might assume that this page is what a Website Builder website looks like, and that would be bad for the company, especially since the PPC links advertise other businesses. Go Daddy should take a cue from How I Met Your Mother’s Bro Bibs website and set up a real website using the Website Builder tools. Obviously they can’t make a real pizza website, but at least they can have some fun with the company’s product and show customers what a website can look like after using its Website Builder product. This is a good lesson for any company using a fake url in a commercial or other visible spot. Make sure you develop it or at least redirect it! H/t to Bram for sending this. **UPDATE*** It looks like there is now a website operating on the domain name. It might be bad for Godaddy but it’s great for companies that provide real website design and marketing services. Hopefully they haven’t read your post today and continue being the poster child for what not to do in the area of website development branding. “Little Frank” is actually a stand-up comedian named Joey “CoCo” Diaz. Wonder what happened with website. I bet they are glad this was fixed. If you look at the example sites that they have as well on the Godaddy site, they are all very generic. As a designer I have signed up and used all the free web services and builders out there. They are all just for lead generation and marketing. Very few people actually build a site and if they do its not very professional.